Noroxin (Norfloxacin) is used to treat a variety of bacterial infections. This medication is used to treat a variety of bacterial infections. Take this medication by mouth, usually twice a day, at least 1 hour before or at least 2 hours after a meal or dairy products (e.g., milk, yogurt). Take with a full glass of water (8 ounces or 240 milliliters). Drink plenty of fluids while taking this medication unless your doctor tells you otherwise. The dosage is based on your medical condition. Take this medication 2 hours before or 2 hours after taking any products containing magnesium, aluminum, or calcium. Some examples include quinapril, certain forms of didanosine (chewable/dispersible buffered tablets or pediatric oral solution), vitamins/minerals, and antacids. Calcium-enriched juices, sucralfate, bismuth subsalicylate, iron, and zinc are also included. These products bind with noroxin preventing its full absorption. Antibiotics work best when the amount of medicine in your body is kept at a constant level. Therefore, take this drug at evenly spaced intervals. Continue to take this medication until the full-prescribed amount is finished even if symptoms disappear after a few days. Stopping the medication too early may allow bacteria to continue to grow, which may result in a relapse of the infection. Inform your doctor if your condition persists or worsens. 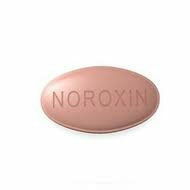 Noroxin belongs to a class of drugs called quinolone antibiotics. It works by stopping the growth of bacteria. This antibiotic only treats bacterial infections. It will not work for viral infections (e.g., common cold, flu). Unnecessary use or overuse of any antibiotic can lead to its decreased effectiveness. Before taking noroxin, tell your doctor or pharmacist if you are allergic to it; or to other quinolone antibiotics such as ciprofloxacin, gatifloxacin, gemifloxacin, levofloxacin, lomefloxacin, moxifloxacin, or ofloxacin; or if you have any other allergies. Before using this medication, tell your doctor or pharmacist your medical history, especially of: seizures, brain disorders (e.g., cerebral arteriosclerosis, tumor, increased intracranial pressure), muscle disease/weakness (e.g., myasthenia gravis), heart problems (e.g., cardiomyopathy, slow heart rate, torsades de pointes, QTc interval prolongation), kidney disease, mineral imbalance (e.g., low potassium or magnesium), history of tendonitis/tendon problems. This drug may make you dizzy or drowsy; use caution engaging in activities requiring alertness such as driving or using machinery. Limit alcoholic beverages. This medication may make you more sensitive to the sun. Avoid prolonged sun exposure, tanning booths or sunlamps. Use a sunscreen and wear protective clothing when outdoors. Caution is advised when using this drug in the elderly because they may be more sensitive to side effects of the drug, especially tendon damage (e.g., tendon rupture). Using corticosteroids (e.g., prednisone) and noroxin together may increase the risk of tendon problems. Caution is advised when using this drug in children because they may be more sensitive to side effects of the drug (joint/tendon problems). Discuss the risk and benefits with your doctor. This medication should be used only when clearly needed during pregnancy. Discuss the risks and benefits with your doctor. This drug may pass into breast milk and could have undesirable effects on a nursing infant. Therefore, breast-feeding is not recommended while using this drug. Consult your doctor before breast-feeding.